SCOTLAND, and a number of Rangers players in their squad, failed to reach the 2002 World Cup in Japan and South Korea, finishing behind Belgium and Croatia in their qualifying group. That led to Craig Brown tendering his resignation as national team manager, and he was replaced by Berti Vogts, who had taken Germany to the European Championship title in 1996. It seemed an ambitious and exciting appointment by Scotland, but it turned into a nightmare, and indeed, no manager has taken the nation to any tournament since Brown in 1998. Scotland’s neighbours, England, had a pretty decent tournament, reaching the quarter-finals where a David Seaman error/piece of genius from Brazil’s Ronaldinho (whichever way you see it) was to cost them as they lost 2-1. They were, however, missing Steven Gerrard from their squad. Having been tremendous in qualifying and grabbing a goal in their remarkable 5-1 away win to Germany, he suffered a groin injury in the run-up to the tournament and had to pull-out. 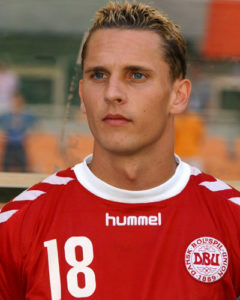 Elsewhere, having ended the domestic season with his unforgettable injury-time winner against Celtic in the Scottish Cup Final, Peter Lovenkrands was rewarded with a place in the Denmark squad. They made it through the group stage with wins over Uruguay and reigning World and European champions France (who failed to progress) and a draw with surprise package Senegal, with Lovenkrands making a late sub appearance in that game. Their tournament was ended, however, with a 3-0 reverse to England in the Last 16. Senegal’s side, which beat France and drew with the Danes and Uruguay before getting by Sweden in the Last 16, eventually fell to a Turkey golden goal in the quarters. 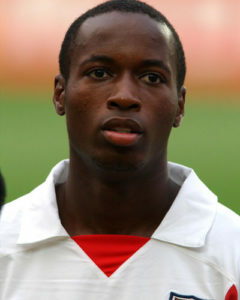 Their squad featured future Light Blues El Hadji Diouf and Amdy Faye. As well as the French, another of the big fallers from the group stage were Argentina, who had recalled Claudio Caniggia to their squad following a decent season at Ibrox. While he didn’t play in their 1-0 win over Nigeria, nor their 1-0 loss to England or 1-1 draw with Sweden, he still managed to pick up a red card from the tournament. After making a remark to one of the officials, referee Ali Bujsaim sent him off just before half-time, making him the first player to ever be red carded in the World Cup despite not playing a game. Other Rangers-related players to be involved in Japan and South Korea were Claudio Reyna of the USA (by now a Sunderland man), DaMarcus Beasley (featuring in his first of four tournaments for the States), Nuno Capucho of Portugal and Rino Gattuso of Italy. DESPITE a pretty miserable season at Ibrox, three Rangers players made it to the 2006 World Cup in Germany, with Croatia’s Dado Prso leading the charge. Prso had become a real fan-favourite in Glasgow, and him joining a hugely talented Croatia squad with their stunning red and white kits made the Balkan nation the one to support for Rangers fans. Led by Zlatko Kranjcar (father of Niko, who would also feature in Germany), they were drawn in Group F with Brazil, Australia and Japan. Naturally, Brazil were favourites, but Croatia were expected to take care of the other two in their pool. Their opening match, with Prso leading the line, ended in a 1-0 loss to the Brazilians. It was no disgrace, though their second game, a 0-0 draw with Japan, put them under pressure going in to the final game with the Aussies. They were led by former Rangers captain Craig Moore, but the Croats got off to the perfect start, with Darijo Srna netting after just two minutes.Needing the win to qualify while Australia needed just a draw, they were pegged back on 38 minutes, with Moore netting from the penalty spot. Captain Niko Kovac had Croatia back in front early in the second half, before in the closing stages, it all kicked-off. Harry Kewell grabbed the leveler the Aussies needed before Dario Simic and Brett Emerton were both red carded. Then, in injury time, referee Graham Poll showed a second yellow to Josip Simunic. The red card, however remained in Poll’s pocket. It was an error of the most almighty fashion, and adding to it was Poll then showing the Croat a third yellow just minutes later before this time sending him off. Moore’s men held on to knock-out Prso’s side, but their adventure ended in the last-16, with a highly contentious 95th-minute penalty from Francesco Totti seeing them crash out. Hamed Namouchi’s tournament, similarly to Prso’s, also ended at the Group Stage. After a decent season at Rangers where he played an important role in their run to the Last 16 of the Champions League, he played in all three of their matches – a 2-2 draw with Saudi Arabia, a 3-1 defeat to Spain and a 1-0 reverse to Ukraine. 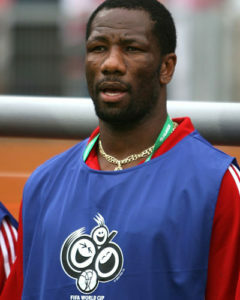 Marvin Andrews also traveled with the first ever Trinidad and Tobago side to reach a World Cup, but was an unused substitute throughout as they did themselves justice with a respectable 0-0 draw against Sweden, a late 2-0 defeat to England with Steven Gerrard grabbing their second goal, and then a 2-0 defeat to Paraguay in the last game. Gerrard enjoyed a terrific tournament, and also netted in England’s final group game, the 2-2 draw with Sweden, although he (as well as Frank Lampard and Jamie Carragher) missed penalties as England were dumped out at the quarter-finals by Portugal again on spot-kicks. From the tournament, Rangers, and their new manager Paul le Guen, would sign Libor Sionko and Karl Svensson from the Czech Republic and Sweden respectively. Svensson didn’t feature at all as the Swedes were knocked-out by Germany in the Last 16, while Sionko made one substitute appearance against Ghana in the group stage, where they were also eliminated. Ghana made it through, as did Italy, the eventual winners from that group. Rino Gattuso had established himself as a world-class midfielder by that stage, and he played in every one of their knockout matches, including the Final, as they lifted the trophy for the fourth time.